As I have mentioned countless times before, Sasha’s biggest challenge is reactivity to other dogs when she is on a leash. Don’t get me wrong, she has improved greatly in the almost 8 months that we have had her! In the beginning, she would go ballistic when she saw a dog all the way down the street; a few months later, thanks to positive training methods, she could see a dog a block away and be relatively calm. However, about two months ago we seemed to hit a plateau; Sasha stopped improving, and actually regressed a little bit. She could no longer focus on me when there was another dog in sight (no matter what treats I used), and could not come down from that high level of arousal after an episode, even long after the dog was out of sight. For these reasons, I decided to try prescription medication for Sasha. Upon taking her to the vet and describing what was happening, my awesome vet prescribed fluoxetine, which is the generic version of human Prozac, to help her. Fluoxetine is a super common medication for dogs, and is prescribed to help dogs with many things, such as separation anxiety and generalized anxiety. Unfortunately, medications such as fluoxetine have stigmas for dogs just like they do with humans. Many people are skeptical and worry that it will mask a dog’s true personality and turn them into a sort of “zombie dog”. However, this could not be further from the truth. Rather than suppress a dog’s personality, anti-anxiety medications actually cause a dog’s personality to shine through even better, since they help dogs to not be constantly in an anxious state. Just like a person taking anti-anxiety medication, dogs will be happier and have a better quality of life because of it. I should mention that, like anything else, anti-anxiety medication is simply a tool to help your dog. The medication itself will help your dog be able to think rather than be consumed with anxiety; this will enable you to train your dog since they will be better able to focus on you. I can say with confidence that fluoxetine has absolutely helped Sasha with her leash reactivity. I noticed a difference with her when she had been on the medication for about 6 weeks: when she got excited about another dog, she seemed to recover from the episode and return to a calm state much more quickly than usual. She also did not react as quickly to other dogs, which gave me more opportunity to distract and train her to prevent her from reacting. Now, after being on fluoxetine for almost two months, I can tell that Sasha’s threshold has greatly improved as well. While two months ago there was no way that a dog could pass us across the street, this distance rarely bothers her anymore. Though she still requires treats and reinforcement, she can watch a dog pass us while remaining relatively calm. After seeing a dog, she also moves on and forgets about the other dog much more quickly than she used to. I no longer have to give her constant treats while we walk away from a dog; now, I just give her a “let’s go!” and she happily trots after me. After about 20 feet I will give her a treat, but then we can carry on with our walk like normal. Though Sasha still requires consistent training to keep improving, there is no way we could have made such speedy progress without fluoxetine. 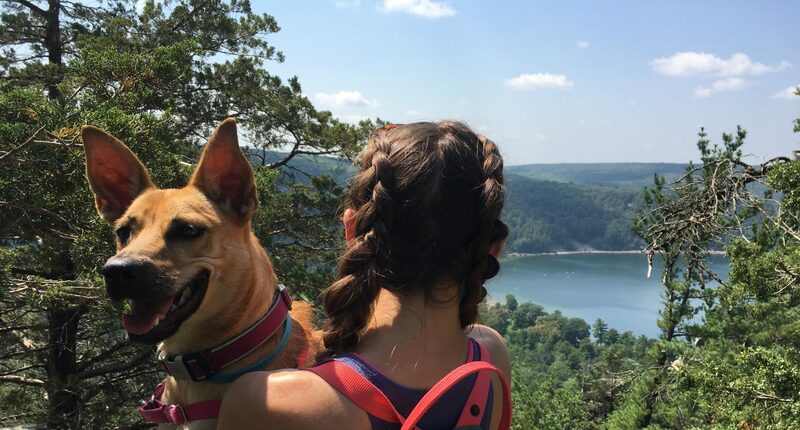 It has opened up so many doors for us: now, stress-free walks are a very real possibility, and we plan on enrolling Sasha in more classes now that it seems like she could handle it. If your situation sounds like mine, and you think your dog could benefit from medication, don’t wait- consult a veterinary behaviorist and see if something like fluoxetine could help your dog. My only regret is that I didn’t do it sooner. On walks now, Sasha is so calm. When she sees another dog she will glance at it, then look at me and sit just like she’s doing in this picture. Next Could Reactive Rover Classes Help Your Dog?